From Tasco we headed south to the coast once more - the main road taking us down to Acapulco. The air soon turned hot and muggy and before we knew it the giant resort high-rise hotels crested the horizon. Acapulco may have been a beloved vacation spot for Elvis, but our goal was to get through it and past it as fast as we could. We stopped for the night in a town called Barra Vieja, just southeast of Acapulco. This part of Guererro's coast is called Costa Chica. We found a place to camp for the night that was pretty rustic, but still held on to the Acapulco tourist prices, unfortunately. We set up our hammock and tent among the trees but were soon besieged by mosquitoes and barking dogs. Jessie got a rash all over her face from something..? and we accidentally ate a 400 peso fish. Overall, Barra Vieja not highly recommended, though we did get some lovely hammock time out of it. The next day brought us to the state of Oaxaca, a wonderful and welcomed sight. We knew we that we were that much closer to our final destination - Zipolite. Our first night in Oaxaca was spent on the island of Chacahua - a place Ian had been back in 2006 and wanted to see again. At the time it was a barely trafficked, untouched island with pristine beaches and great waves for surfing. We pulled off the main road and took a bumpy dirt path about 30k towards the ocean (we got to air down our tires for the first time). We found a spot to park our car (30p) and hopped a boat across the river mouth (15p per person) to the island of Chacahua, where we walked down a dusty dirt road for a bit until we found the beach. Much has changed in Chacahua in the past 10 years, but we still found it a sleepy beach spot for backpackers willing to push beyond the beaten path. 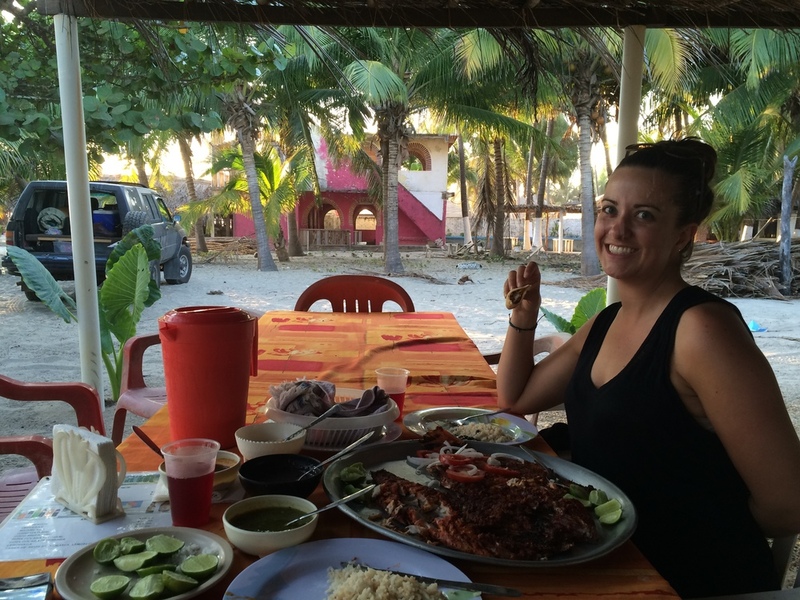 We rented a little cabana (200p) for the night, did some swimming, laid in hammocks, listened to the waves, and ate some delicious fish. The next morning we hopped a boat back to Lorraine and drove back out the main road, passing a band of horses on the way. This brought us to Puerto Escondido a big surf town on the ocean just northwest of Zipolite. We decided to spend the night here, as well, to walk the oceanfront main strip, and watch the pounding waves that make this spot a primetime location for international surfing competitions. We stayed at the Hotel Acuario, on the Playa Zicatela strip. We crashed a wedding, drank two-for-one cocktails at happy hour and watched the sun go down. Buenissimo. That next day was a hop-skip-and-jump to Zipolite - our home away from home, at long last. We both heaved a sign of relief to be back at one of our favorite places in the world. We checked into our usual spot - Hotel Lyoban, and we've been blissing out ever since. Zipolite is a place where one is encouraged not to do to much. Really, you should try not to do anything at all, if you can swing it. Lay in the hammock, dip in the ocean or the pool, walk along the water. Eat. Drink. Lay some more. Heaven. We've been here a week so far and will be hitting the road on Monday, heading back up north and ultimately to Chicago, where it is currently frigidly cold, and snowing snowing snowing. We'll post more from out time in Zipolite soon. But for now, we do nothing.